Imagine this scenario: You're in an accident that renders you unconscious or unable to respond. Your wallet or purse is missing, but your iPhone is still around. Your phone contains an emergency contact as well as your medical history and information. But your iPhone is locked with a passcode, so the medical staff can't access the data that may be necessary to help treat you or inform your family about your condition. Is there a way around this Catch-22? Yes, there is. You can set up your health data so it's available to the right people. In a move to capitalize on a growing trend of tracking health and fitness information, Apple introduced a new Health app with iOS 8. The Health app, which is also available for the Apple Watch, is designed to monitor your health and fitness. The app doesn't do a lot on its own, but gives you a way to put data from all kinds of apps in one place. One other useful feature built right into the Health app is the ability to collect and store your medical history and information. You can store the medical conditions that affect you, the medications you take, your allergies, your medical history and a person to contact in the event of an emergency. Let's look at how to set up that information. Next, tap the Medical ID icon at the bottom of the screen. At the Medical ID screen, tap the Edit link at the upper right. Your name and photo should appear. Add your birthday if it does not appear. Fill our each section as appropriate. In the Medical Conditions section, enter your medical conditions and ailments. In the Medical Notes section, enter any notes or alerts regarding your overall medical status. Here you can list any operations or procedures you've received. For example, I had a heart attack last year, so I've described the attack in this section along with details on the stent that was inserted. In the Allergies & Reactions section, list any allergies or reactions you have to certain medications, foods, or other items. For example, my nephew is allergic to nuts, so that would be listed in his ID. In the Medications section, list all of the medications you take, including their frequency and dosage. You should also include any supplements that you take. Scroll further down the screen. Tap the link to add an emergency contact. The app displays your iPhone contacts so you can select your spouse, a parent, a child or someone else you wish to be contacted in the event of an emergency. Fill out the remaining sections for blood type, organ donor, weight and height. When you're finished, scroll to the top of the screen. You'll see an option to Show When Locked. Make sure this option is turned on, so that it shows up as green. Why turn this on? I'll explain in a moment. Tap the Done link in the upper right to finish editing. You can now scroll down the screen of your Medical ID to review all the information. Okay, now let's imagine you're in an accident or other emergency, and a medical professional needs to access your medical information, but your iPhone is locked with a passcode. To first test this out, lock your iPhone by pressing the on/off button. Tap the home button to turn the iPhone's screen back on. Swipe your finger to the right to display the Touch ID screen. Tap the Emergency link in the lower left corner of the screen. At the dialpad, tap the * Medical ID link in the lower left corner of the screen. This link is available to anyone because you enabled the option to Show When Locked. 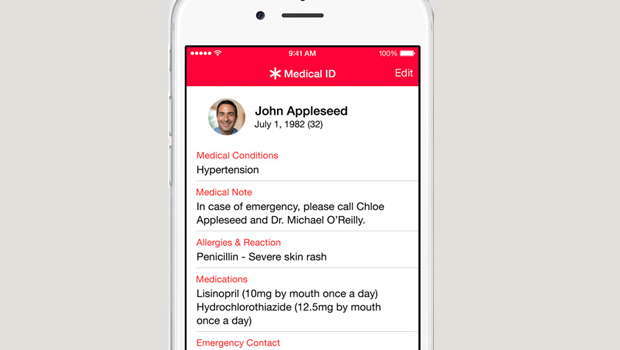 Your Medical ID screen now appears, so the medical professional can now access your medical information in order to know how to treat you. Of course, the medical professional would need to know how to access your Medical ID. But many doctors and nurses -- especially those in emergency rooms -- are becoming more tech savvy in their effort to better treat their patients. Access to your Medical ID can be invaluable to someone who needs to treat you -- if you're unconscious or unable to respond -- and needs to know your medical history. Adding and keeping this information up to date could even save your life one day.